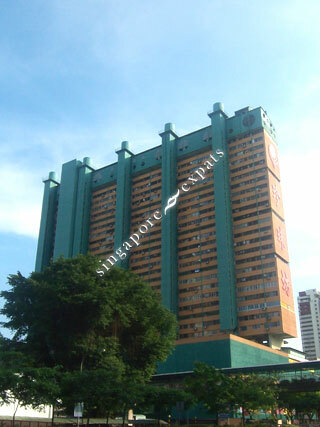 PEOPLE'S PARK COMPLEX is located at 1 PARK ROAD in district 01 (CBD, Chinatown, Marina Bay) of Singapore. PEOPLE'S PARK COMPLEX is a 99-year Leasehold Condo development. PEOPLE'S PARK COMPLEX is completed / TOP in 1970 (estimated). Educational institutions like JEWELLERY DESIGN & MANAGEMENT INTERNATIONAL SCHOOL, CHATSWORTH INTERNATIONAL SCHOOL (ORCHARD), ISS ELEMENTARY & MIDDLE SCHOOL, CANTONMENT PRIMARY SCHOOL, RIVER VALLEY PRIMARY SCHOOL and ZHANGDE PRIMARY SCHOOL are near to PEOPLE'S PARK COMPLEX. PEOPLE'S PARK COMPLEX is accessible via nearby CHINATOWN, OUTRAM PARK and TELOK AYER MRT Stations. People's Park Complex is in the heart of historic Chinatown and a stone's throw from the Central Business District. If you want a taste of old Singapore and Chinese culture, this is the place to be. You can't miss this bright green and yellow-building situated along Eu Tong Sen Street. People's Park Complex was apparently one of the first high-rise commercial and residential centres in Southeast Asia when it opened in 1970. It is still a bustling shopping complex known for its traditional Chinese treatments, herbal tea shops, travel agencies and gold jewellery stores. Right outside the complex near the Chinatown MRT exit, you'll find the so-called 'Cobbler Square' where elderly cobblers ply their trade at makeshift stalls, repairing shoes for the many office workers exiting the MRT. You can find the residential apartments located above the shopping complex. It's much quieter up here and residents are treated to fantastic views of the city. Because it is an older building, rentals here are more affordable than newer condominiums in the area. But don't be fooled by appearances. If you look carefully, you can find apartments whose interiors have been completely remodelled with beautiful decor, contemporary fittings and furnishings, as well as new kitchens and bathrooms. If you're looking for a modern apartment at an affordable price, this is an ideal location for those working in the city. Chinatown MRT is on the ground floor and it's a short trip from here to the business district (Tanjong Pagar, Raffles Place), entertainment, arts and nightlife areas (Clarke Quay, Marina Bay, Esplanade), great shopping (Orchard Road) and the resort island of Sentosa. You can get most of your basic needs within the Complex itself - supermarket, Western clinics, lawyers' offices, eateries, beauty and health stores etc... And you can easily find banks, gyms, schools, department stores and other amenities within a short walking distance. There's also a huge variety of food in the Complex and the adjoining People's Park Food Centre. People's Park Complex certainly has a unique character and old world charm to it. Looking from a distance at this iconic building amidst a sea of modern skyscrapers and department stores, People's Park Complex is a fascinating reminder of Singapore's yesteryear and a reflection of how we can still embrace the past in this modern cosmopolitan city.